Charles Pacey was one of five men named on the Bottesford War Memorial who served with the Canadian Expeditionary Force (CEF) during WW1 – Charles Bend, Arthur Gilding, Frank Raithby, Charles Pacey and Robert Turlington Noble Page. 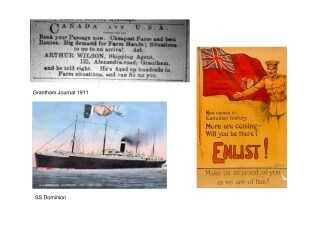 All five emigrated to Canada in the early 1900s. None would survive. As a pupil at Bottesford School Charles Pacey would have been well acquainted with the ‘opportunities’ for young men in Canada. After further education at Sedgebrook Grammar School and apprenticeship with his father as a plumber Charles left Easthorpe seeking those opportunities. Assisted passages were available for those with agricultural experience. Although trained as a plumber he was listed as a ‘gardener’ in the ship’s immigration records. After arriving in Toronto he and Arthur did not remain together. Charles headed for Saskatchewan near Rosetown where on enlistment in 1914 he stated he was a ‘waiter’. After work in Ontario Arthur Gilding would follow Charles to work in Regina, Saskatchewan, as a butcher. 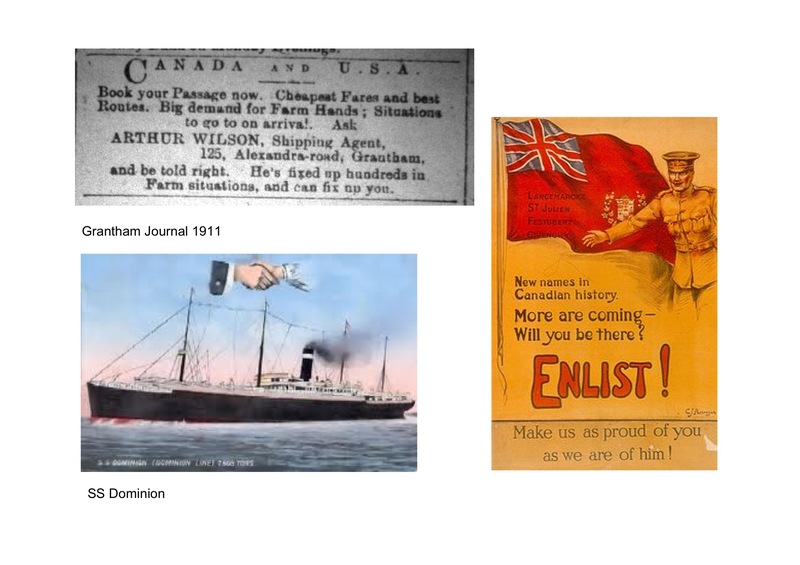 Many of the recent immigrants to Canada were eager to see active service and take up the opportunity of a free passage back to Europe. It was also widely reported that the conflict would be short. The first wave of recruitment was heavily oversubscribed. Charles Pacey’s medical enlistment form was initially completed at Kindersley, near Regina, Saskatchewan on the 10th November 1914. His attestation papers gave his occupation as ‘Waiter’ with 2 years military experience in the 95th Saskatchewan Rifles, a militia reserve regiment. At the outbreak of war ‘rumours were rife’ that Manitoban recruits would be first to see action. Charles must have made the decision to travel east from Saskatchewan to Manitoba with his papers to complete his enlistment at Winnepeg. 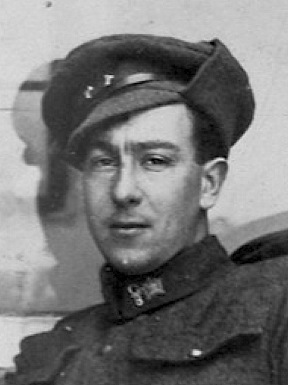 He was first drafted into the 32nd Training Battalion of the Canadian Expeditionary Force in Saskatchewan and then transferred into the 8th Battalion in Winnipeg. He joined ‘A’ Company in 8th Infantry Battalion also known as the 90th Winnipeg Rifles. 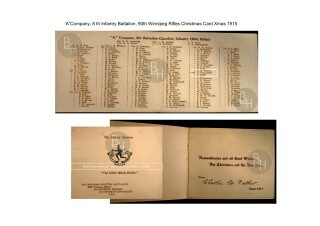 In 1915 his sent home a Regimental Christmas card. It proudly names everyone in ‘A’ Company. There would be no such Christmas cards in subsequent years. 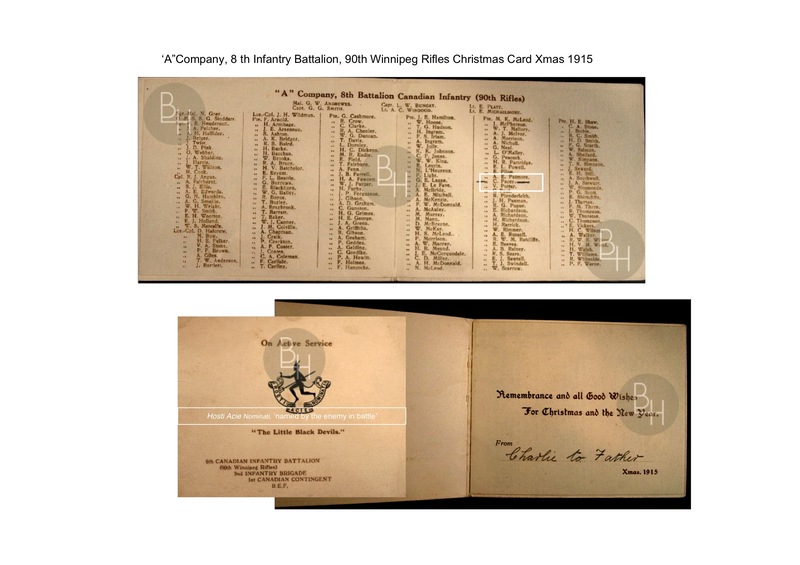 Many of the men named on that 1915 card would not see another Christmas. On the 23rd February 1915 Charles Pacey sailed from Halifax, Nova Scotia on the S.S. Vaderland arriving at Avonmouth on the 7th March 1915. Unlike the first draft of men who had arrived the previous October to be encamped on Salisbury Plain, Charles’ contingent went directly to a permanent training base at Shorncliffe near Folkestone. This channel port location facilitated rapid deployment and transport to France whilst providing superior quarters to the tents of Salisbury Plain that had exposed the first group of Canadian recruits to the rigors of damp cold winter weather. Men who were initially encamped on Salisbury Plain, although used to sub zero low humidity temperatures of Canadian winters, would succumb to hypothermia and illness. Charles included vivid descriptions of trench fighting with the 8th Battalion. The Canadian Division suffered 2,204 casualties over 8 days of engagement during the Battle of Festubert (please see the ‘Long Long Trail’ for further details http://www.longlongtrail.co.uk/battles/battles-of-the-western-front-in-france-and-flanders/the-battle-of-festubert/). (…) Don’t send me any more parcels for I expect to be going home any day now if nothing happens (.) so with the best of luck I hope to be seeing you & the old home again (.) so you can guess how much I am looking forward to a rest & I rightly think I have earned one don’t you. I expect to send you a wire from London to let you know when to expect me. I am writing this in the firing line in a cold dug out (.) by gee its wonderful how our boys are standing it (.) Well good luck Dad from your affectionate Son Charlie. This would be his first and only leave home to see his family in Easthorpe. That February it snowed and photographs show him outside in the snow with family members and standing against the picket fence holding his rifle. He is still wearing combat clothes with trench wear and tear on his unpolished boots. 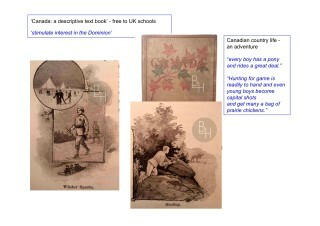 His rifle, a Canadian issue Ross rifle, would leave its mark on his home and his subsequent life at the front. An ungainly and heavy firearm, over 5ft in length with attached bayonet, it gouged the ceiling of his parents’ cottage in Easthorpe. Mrs. Audrey Pacey remembers that mark as unrepaired for many years. The Ross rifle was unreliable, jamming if the breech became slightly dirty. It was also prone to back-fire causing severe injuries if the bolt was not securely in place. Its length and weight at 9lbs. 4 oz., made it unsuited for close quarter combat and the bayonets were prone to falling off in charges. It was only in service because General Sam Hughes, Canadian Minister of Defense, had insisted on its production and issue to Canadian forces. Hughes’s disdain of political control would result in his enforced resignation in late 1916. The Ross rifle was subsequently withdrawn from general service in mid 1916 and Canadian forces were issued with the British Army standard Lee-Enfield Rifle. Field Punishment No. 1 (FP No.1) was both degrading and severe. It involved being tied to fixed object such as a gun carriage, two hours at a time, for up to three days out of four, to 21 days in total. In addition this punishment resulted in total loss of pay and hard labour for as long as it took to administer. On the 15th July two days before being put on charge he had written home. He described writing during heavy shell fire and how the Battalion had that day been withdrawn from front line duty. However they still had to go to up to the front line ‘every night to dig so in a sense we are better off in the trench as regards rest’ (…) they say this morning that they are going to move us down the line so I (am) for some more digging etc”. Tired and having survived the harsh conditions of three major battles (Aubers Ridge 9th May, 1915; Festubert 17-25th May, 1915 and the Second Action of Givenchy 15-16th June, 1915) it would have been easy to react adversely, perhaps to the new cadre of NCOs who would have arrived as reinforcements. Such NCOs would have replaced experienced men who had gained the trust and respect of the men they commanded. Charles Pacey was never promoted despite 2 years militia experience and his extensive front line duties. His close friend Arthur Gilding and fellow scholar Charles Bend were promoted. Did his recorded punishment mark him out? Was that the reason he was put on the exposed role of stretcher bearer and medical orderly? Or had he volunteered? 1916 would be a difficult year for Charles and his family. 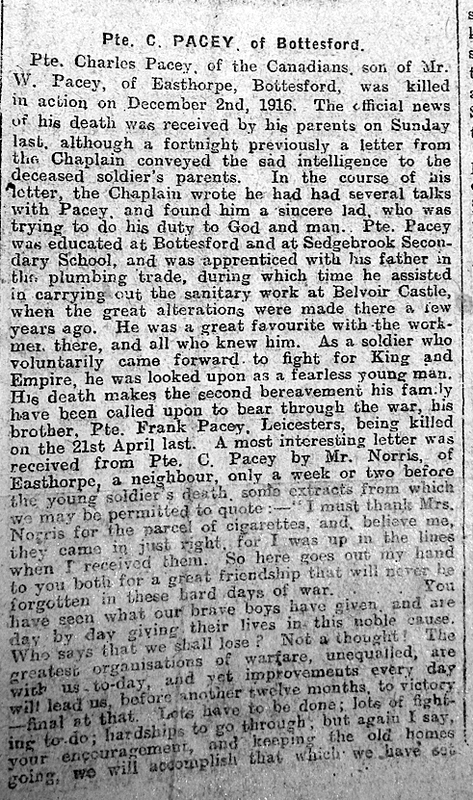 He and the family would experience the loss of his younger brother, Frank Pacey, who died of wounds on the 4th April 1916, whilst serving with the 1/5th Battalion Leicestershire Regiment. 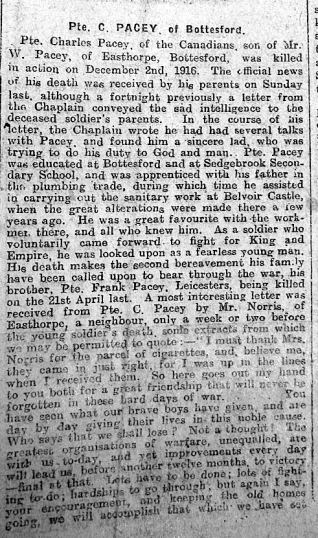 Arthur Gilding, a friend of Charles since childhood, who had been posted to the same Battalion would also die of wounds in the September. The family would then have to suffer Charles loss in December 1916. Between the 12th to the 14th June 1916 the 8th Battalion took part in the battle to take Mount Sorrel in the south of the Ypres Salient. They suffered heavy casualties in their 3 days of front line action under heavy enemy fire. On the night of the 15/16th June after their withdrawal from the front line 3 Officers and 75 men volunteered to retrieve the wounded from Mount Sorrel. As a stretcher bearer he could well have been one of those volunteers. Charles sustained a shrapnel wound to his left hand and was eventually hospitalised for three weeks on the 17th June. On recovery he rejoined his battalion on the 7th July 1916. The Officers, NCOs and men of the battalion who arrived in camp were completely used up and totally incapable of further effort at the time. There was hardly a officer or man without some slight wound and many had wounds which required dressing and for which they should have gone to the Hospital. But the complete physical fatigue caused by the lack of three days sleep, loss of 24 hours rations and great nervous strain was the most marked feature on all hands. In spite of this 3 Officers and 75 men volunteered to go back to Mount Sorrel on the same evening and try to carry out our wounded. This they succeeding (sic) in doing very thoroughly without any shell fire to interrupt them and they cleared all our wounded who could be found. After we held a muster parade to-day. Charles and Arthur Gilding had survived. Sadly Arthur Gilding would not survive a subsequent injury. 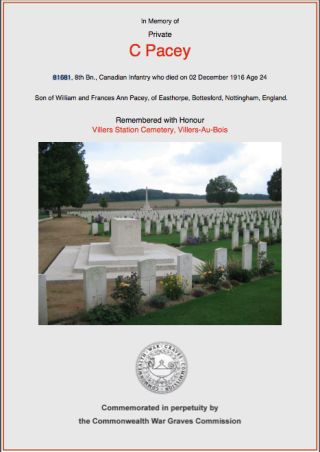 He died of wounds on the 13th September 1916. Some time after that date Charles wrote home. It is clear that working as a stretcher bearer and medical orderly was a very exposed role. Charles may well have attended that one casualty, his friend and comrade. There would be one further letter home written on the 8th November 1916. Ever mindful of his family he requests his father to buy on his behalf 21st birthday presents for his sister, Sarah and his cousin who lived in Grantham . Weather dull, cold and misty. Situation throughout the day: Normal. Enemy was aggressive with trench mortars. Our trench mortars effectively retaliated. I must thanks Mrs Norris for the parcel of cigarettes, and believe me they came in just right. For I was up the lines when I received them. So here goes out my hand to you both for a great friendship that will never be forgotten in these hard times of war…. You have seen what our brave boys have given and are day to day giving their lives in this noble cause. Who says that we will lose? Not a thought! The greatest organisations of warfare, unequalled, are with us today, and yet improvements everyday will lead us, before another twelve months, to victory – final at that. Lets have to be done; but again I say, your encouragement, and keeping the old home going, we will accomplish that which we have set out to do. The day after Charles’s death 40 reinforcements were required to bring the 8th Battalion back up to strength. 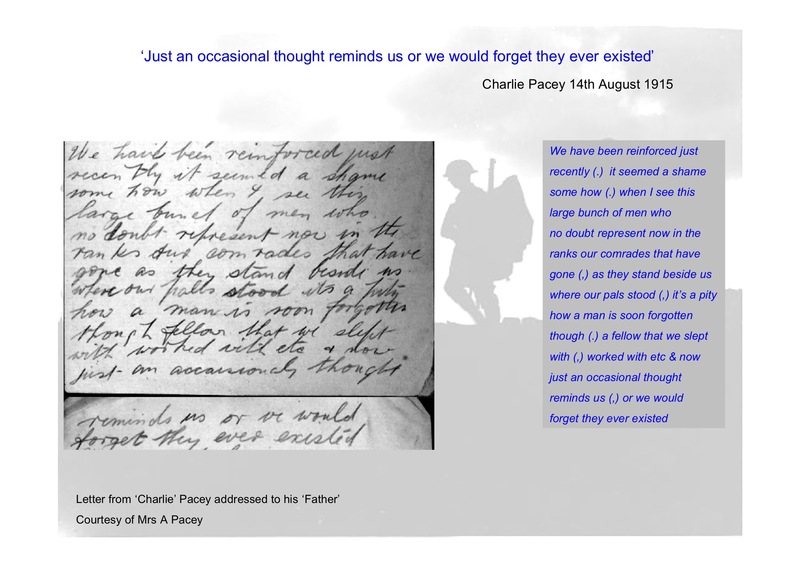 In his letter home the previous year Charles reflected on the significance of new reinforcements to the surviving man of the Battalion. We have been reinforced just recently (.) it seemed a shame some how (.) when I see this large bunch of men who no doubt represent now in the ranks our comrades that have gone (,) as they stand beside us where our pals stood (,) it’s a pity how a man is soon forgotten though (.) a fellow that we slept with (,) worked with etc & now just an occasional thought reminds us (,) or we would forget they ever existed. 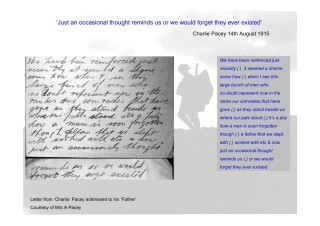 Charlie Pacey is not forgotten, nor are his brother Frank and friend Arthur Gilding. 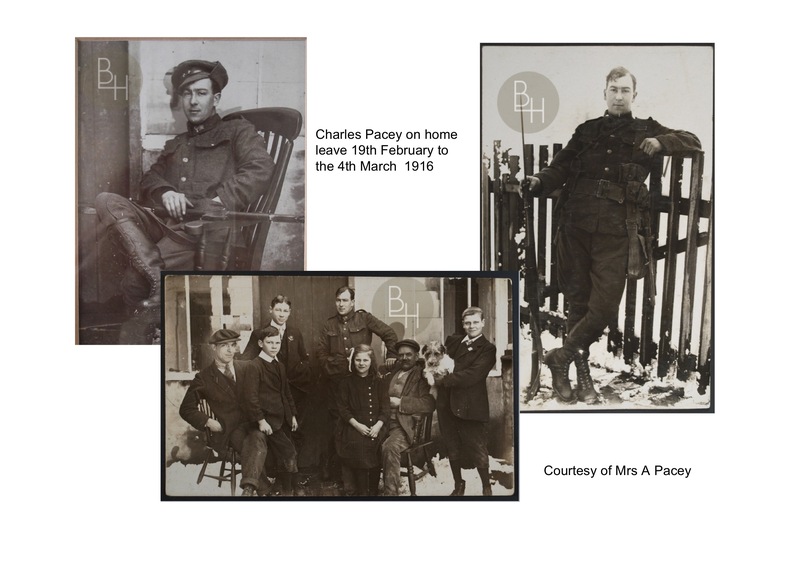 Access to documents, letters and photographs kindly granted by Mrs. A Pacey and family.